President Trump has invited Russia's President Vladimir Putin to come to Washington this fall to continue the talks they started in Helsinki this week. It's another sign of Trump's efforts to build closer ties with Moscow, even though he insists his administration has taken a hard line toward Russia. PRESIDENT DONALD TRUMP: There's never been a president as tough on Russia as I have been. KING: NPR's Scott Horsley reports on the administration's track record in dealing with Russia and how it sometimes conflicts with the president's own rhetoric. SCOTT HORSLEY, BYLINE: Trump's claim that he's the toughest president ever when it comes to Russia sounds like hyperbole, but in this case, there's actually some basis for the president's boast. Daniel Vajdich of the Atlantic Council says when it comes to dealing with Moscow, Trump is light years away from his predecessor, Barack Obama. DANIEL VAJDICH: When you actually look at the substance of what this administration has done, not the rhetoric but the substance, this administration has been much tougher on Russia than any in the post-Cold War era. HORSLEY: Take military spending. Vajdich notes Trump sought to add $1.4 billion this year to the European Reassurance Initiative, a military effort to deter Russian aggression. That's a 41 percent increase from the last year of the Obama administration. The president also agreed to send lethal weapons to Ukraine, a step that Obama resisted. And Trump gave U.S. forces in Syria more leeway to engage with Russian troops. VAJDICH: Those loosened rules of engagement have resulted in direct military clashes with Russian militants and mercenaries on the ground, actually resulting in one incident in hundreds of casualties on the Russian side. HORSLEY: The administration has also imposed sanctions on dozens of Russian oligarchs and government officials. And Trump has aggressively promoted U.S. energy exports. Although Ed Chow of the Center for Strategic and International Studies says, so far, that hasn't created much competition for Russia's oil and gas. ED CHOW: Russian gas sales to Europe last year were at record levels. Russians will always have a cost advantage. And if they want to protect market share, all they have to do is to lower the price. 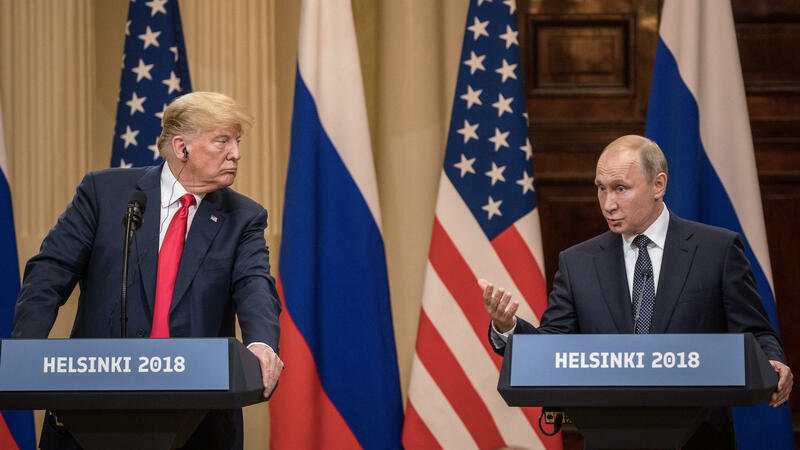 HORSLEY: And whatever tough policies the White House may have adopted towards Moscow have to be weighed against Trump's rhetoric, which is consistently friendly to Putin. For example, Trump suggested inviting Russia to rejoin the G-7, a seat Moscow lost after its illegal annexation of Crimea. RICHARD FONTAINE: There's a real disconnect between the president's words and the underlying policy. HORSLEY: Richard Fontaine is president of the Center for a New American Security. While Trump has no qualms about criticizing leaders of allied countries like Angela Merkel, Justin Trudeau or Theresa May, Fontaine says the president almost always treats Putin with kid gloves. FONTAINE: The president very rarely speaks about Putin's transgressions, and when asked about him, often expresses the hope that everyone can get along. TRUMP: If we could develop a relationship which is good for Russia, good for us, good for everybody, that would be great. HORSLEY: This is Trump last week during a news conference with U.K. Prime Minister May. He recalled how they asked him earlier this year to expel Russian intelligence agents to punish Moscow for the suspected poisoning of an ex-spy. TRUMP: We expelled - how many people? - 60, and Germany did three. HORSLEY: The Washington Post says Trump was irritated that the U.S. seemed to be taking stronger actions against Moscow than the Europeans were. The president also reportedly was reluctant to send those lethal weapons to Ukraine, arguing again that Europe should take the lead. However grudging Trump's moves against Moscow might have been, though, his defenders say the actions speak for themselves. Scott Horsley, NPR News, the White House. Transcript provided by NPR, Copyright NPR.